We launched the Ribeira Do Corso 2012 DOC Red Reserve, from Planalto Mirandês (Trás-os-Montes), Touriga Nacional / Syrah. This month we launched the first organic wine of Trás-os-Montes, the Ribeira do Corso 2012 DOC Red. Using a known brand in the market, Ribeira do Corso represents our premium range, wich is synonymous with the best wines in every Vintage. Is a young wine made from Touriga Nacional, Tinta Roriz and Touriga Franca. A wine easy to drink, very natural, because it was not worked with oenological products os reference. 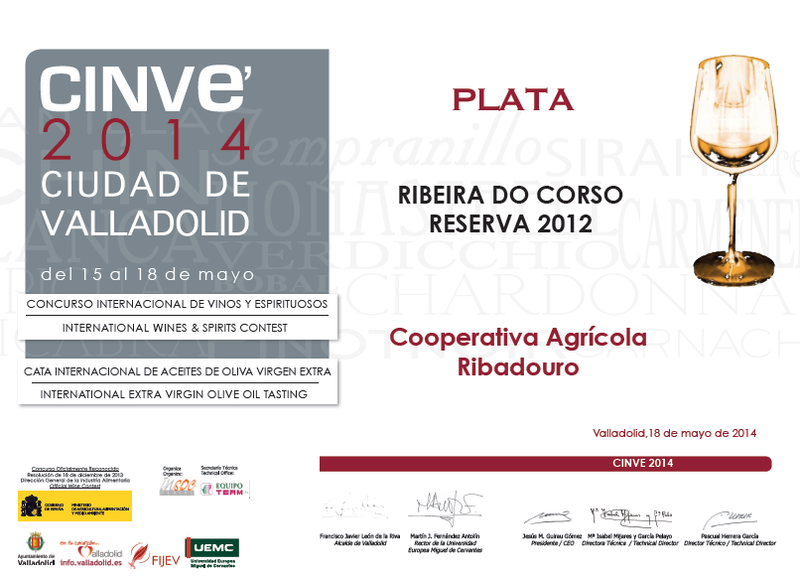 Cooperativa Agrícola Ribadouro CRL owns various awarded wines. Over the last six years, it has received numerous awards in international, national and regional competitions. Ribeira do Corso Red 2010 DOC - Aníbal Coutinho's Popular Wine Guide Selection 2013. Ribeira do Corso DOC 2004 White has been awarded with the Broze Medal in the Trás-os-Montes Regional Competition. 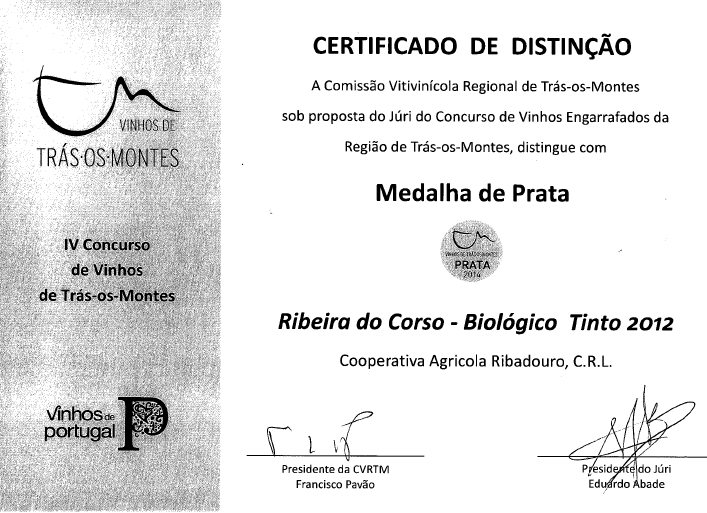 Ribeira do Corso RESERVE 2007 White has been awarded with the Bronze Medal in the Trás-os-Montes Regional Competition. Ribeira do Corso DOC 2004 Red has been awarded with the Silver Medal in the Trás-os-Montes Regional Competition. 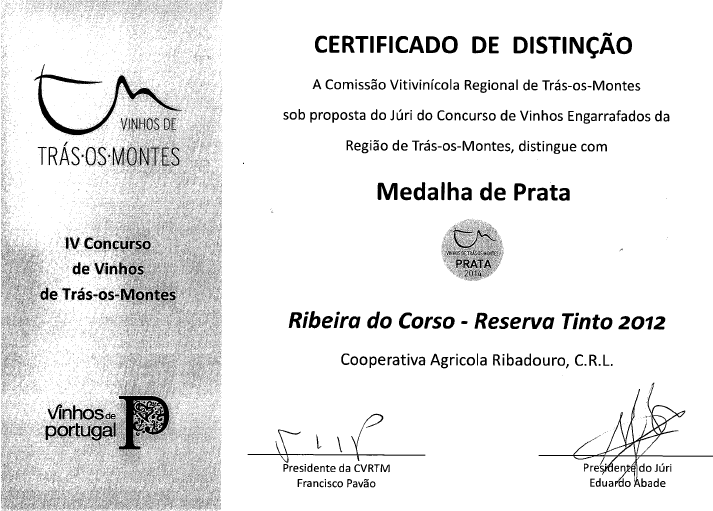 Ribeira do Corso RESERVE 2006 Red has been awarded with the Silver Medal in the Trás-os-Montes Regional Competition. Lhéngua Mirandesa IGP 2003 Red has been awarded with the Silver Medal in the Trás-os-Montes Regional Competition. Ribeira do Corso DOC 2004 Red has been awarded with the Silver Medal in the National Wine Competition. 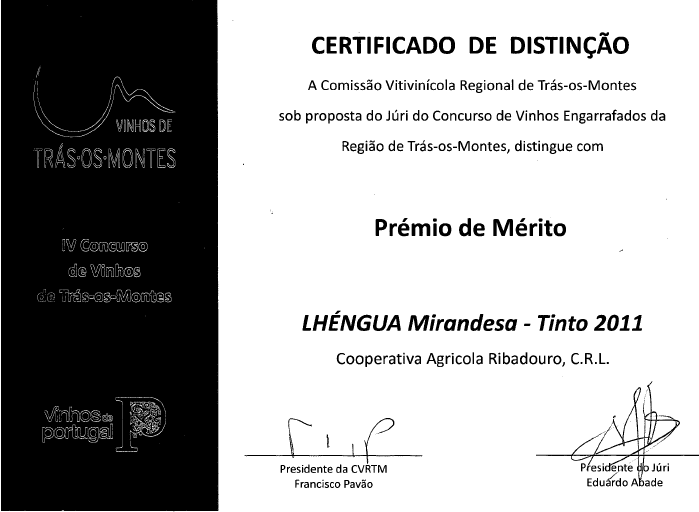 Ribeira do Corso DOC 2004 White has been awarded with the Gold Medal in the Trás-os-Montes Regional Competition. Lhéngua Mirandesa IGP 2008 White has been awarded with the Silver Medal in the Trás-os-Montes Regional Competition.